Louis XIV. Marie Antoinette. The stories surrounding them h ave spawned all sorts of literary endeavors. 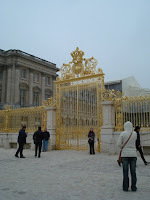 On a very cold morning, we boarded buses for our trip to the palace at Versailles. Upon our arrival, we headed for the gardens. Group tours are scheduled at certain times in order to keep congestion to a minimum and control the crowds. As with the Monet gardens, October was not the time of the year to be viewing gardens. The flowers had already been removed and the ground prepared for the winter season. It was still amazing to see the bushe s and trees that were trimmed in intricate patterns and take in the immensity of the project. 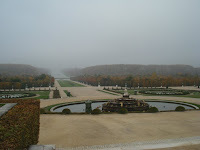 The gardens have been reduced since the time of the “sun king” but they still stretch as far as the eye can see. Our group found a niche out of the cold breeze and waited for our appointed time to go through the palace. 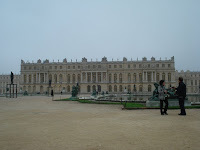 The original palace was actually a hunting lodge and when Louis XIV took over, he expanded it and created the opulent decorations Versailles has made famous. Even the horses had an elaborate building which housed them. The story of the king’s morning routine intrigued me. 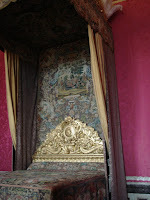 The king and queen had private quarters but there was also a bedroom for the king that was more public. Each morning, he would climb out of bed and shuffle to the ceremonial bedroom where the official morning began with his courtiers and government counsel “waking” him and dressing him. The pr ivate apartment was apparently not so private on the wedding night. 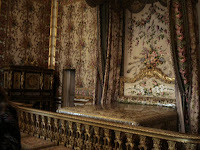 Marie Antoinette’s bedroom contains a beautiful bed separated from the rest of the room by a three foot high balustrade that cordoned off the room so that the viewing public could be assured that the king was doing his job and procreating. 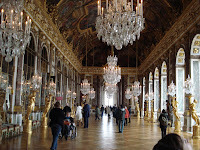 Of course the most famous room is the Hall of Mirrors. It is s pectacular and I’m sure was even more so when the mirrors were all new and the room was aglow in candlelight. With all of this splendor and display of wealth, is it so hard to imagine why the French commoners revolted?